Yvonne at the Burlington County Book Festival (NJ). Photo by Jon Braun. Welcome to my Resources for Teen Writers page! I've compiled the best of my Teen Tuesday posts into one place for easy access. Scroll down for interviews with editors who publish teens and young writers, other potential places to send your writing, advice from authors, helpful books and resources, plus more. I hope you find it useful on your creative journey! Looking for places to send your work? Here are links to my Teen Tuesday interviews with editors who publish teen writers. Note: Always check the websites for current submission guidelines. Pencil Tips: Author Jacqueline Jules' website includes a list of magazines and contests that accept student work for consideration. Polyphony H.S. is a literary magazine which publishes high school students from around the world. The annual student-run publication is open to submissions until May 30th. Payment is a contributor's copy, but for teen writers looking for feedback, they seem to have a thorough editing and review process. They accept poetry (up to 80 lines) along with fiction and literary nonfiction (up to 1500 words). Check out these helpful links: Submission advice, Polyphony H.S. submission guidelines, and How to submit your work. Stone Soup: This magazine is published every two months, and has been in print for the last forty years. Stories, poems, book reviews, and illustrations are contributed by writers and artists under the age of thirteen. Guidelines, as well as highlights from past issues, are available online. Teen Ink is a literary magazine and website that features poetry (including song lyrics, sonnets and haikus), fiction, book reviews, hot topics in nonfiction, and art/photos. The site also provides two forums for teens -- a regular one for chatting and a writers' workshop for sharing creative work. Teens also provide reviews about colleges and summer programs. Sign-up is required for submissions (which they accept year-round) and participants must be 13 to 19 years old. To learn more, check their submission guidelines. ​Please verify all contest deadlines and details by visiting the sites directly. Manningham Trust Student Poetry Contest (National Federation Of State Poetry Societies, Inc.) Poetry contest which typically ends at the beginning of March. Entrants: US students in Grade 6-8 (Junior Division) and Grades 9-12 (Senior Division). Cash prizes. Detailed rules are available on the NFSPS website. Nonesuch Humor Contest (The Mark Twain House). Submit original humorous essays and stories up to 7000 words. Typically runs mid-February through early July. Entrants: Separate categories for adults and young writers. Cash prizes. Entry fee. For more information and complete guidelines, visit the Mark Twain House contest website. 1000 Words for $1000 Story Contest (The Leyla Beban Young Authors Foundation). Contest for short fiction that must be *exactly* 1000 words. Typically runs from November 1st through February 1st. Entrants: Students in grades 6-12. Cash prizes for grades 6-8 and grades 9-12. Visit the Bluefire contest page for complete information. Teen Ink Community Service Essay Contest. Deadline is ongoing throughout the year. "What do you do to make your community a better place? How has volunteering changed you and the way you view the world? Write an essay describing your experiences and be recognized for all that you do." Entrants: teen writers. Essays should be between 150 and 1,000 words. Each year at least two teens are honored for outstanding service to their community. Contest winners receive donation to their favorite charity and a copy of the magazine featuring their winning essay. Visit the Teen Ink Community Service Essay Contest site for more information. 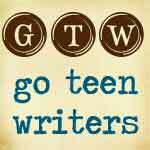 Go Teen Writers "exists to provide encouragement, instruction, and community for teen writers.” Run by Stephanie Morrill and Jill Williamson, it also features a private facebook page and resources about writing, such as How to Write a Novel. Jill says, “We provide a consistent environment where teens can learn and ask questions. We post consistently, hold a variety of contests, and have guest bloggers who are professional authors, editors, or literary agents. We also provide a community for teens to meet other writers and form support and critique groups.” For more info and advice, read my interview with Stephanie and Jill. NaNoWriMo has a modified program for "young" writers (classified as 17 and younger.) Even if you're not participating, the website includes free access to downloadable workbooks (elementary, middle, or high school), pep talks for motivation and encouragement, and other resources. Teen Ink features poetry (including song lyrics, sonnets and haikus), fiction, book reviews (including a review of Pandemic), hot topics in nonfiction, and art/photos from students ages 13-19. The site also provides two forums for teens--a regular one for chatting and a writers' workshop for sharing creative work. Writer Beware: From the Science Fiction and Fantasy Writers of America, this site contains valuable information for writers of all genres about avoiding common writing scams. Children's author Cynthia Leitich Smith provides information on "Writing Books For Children and Teenagers," including an extensive list of links and book recommendations. The Association of Authors' Representatives (AAR): An organization for literary agents. The site includes a searchable agent database. The Authors Guild: A professional association for published writers. The site contains free content for nonmembers, including contests and publishing news. National Coalition Against Censorship: Dedicated to censorship issues. Society of Children's Book Writers and Illustrators: An international organization for published and pre-published writers and illustrators of children's books. Includes helpful links and resources listed online.